On this date in 1794, the Polish princess Rosalie Lubomirska was guillotined during the Paris Terror. The hottest thing to come out of Chernobyl before 1986, the glamorous young Lubomirska had it all going for her before Europe turned revolutionary. Her support for the reformist Patriotic Party in her homeland required her flight on to France when a Russian invasion defeated that movement in 1792. Indeed, short as her own thread was cut, Rosalie Lubomirska was only barely outlived by the Polish-Lithuanian Commonwealth itself. But escaping to her friend Marie Antoinette in France might not have been the savviest choice. The irrepressible Melanie “Madame Guillotine” Clegane, author of such topical historical fiction as The Secret Diary of a Princess: A Novel of Marie Antoinette, has everything you need to know about Rosalie Lubomirska’s activities from that point in this post: going royalist after the execution of Louis XVI, taking Vendee rebels into her salon and/or bed, and seeing her lovers precede her to the guillotine while she desperately bought time by feigning pregnancy. She left behind a young daughter. 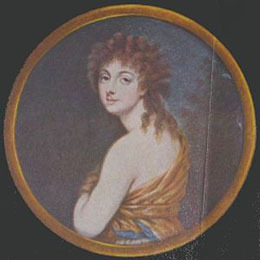 In much later years, this little girl grown up and married to noted Orientalist scholar Waclaw Seweryn Rzeuwski would manifest as a side character in a very different story: she is “Aunt Rozalia”, whose niece was Ewelina Hanska, the admirer turned wife of the novelist Honore de Balzac. Aunt Rozalia was a bitter foe of Ewelina’s declasse romance with the bourgeois scribbler and to judge by the correspondence of the lovers was continually trafficking in rumors that Balzac — who was in actuality a legendary workaholic — was a gambler, boozer, or suchlike dissipated wastrel. Balzac gave his antagonist the gift of literary immortality by using her as an inspiration (one inspiration: his own mother was another) for the titular killjoy spinster in his novel Cousin Bette.